This propane burner is the same as our H210 burner, but for low pressure propane applications. Twenty individual jets combine to produce heat that will boil your water or wort in a hurry. Should be installed and connected by a professional plumber. Flame height is 2 to 3". Ring Dia is 8" the inlet thread is 1/2" Female Pipe Thread. These item is not intended for indoor use. 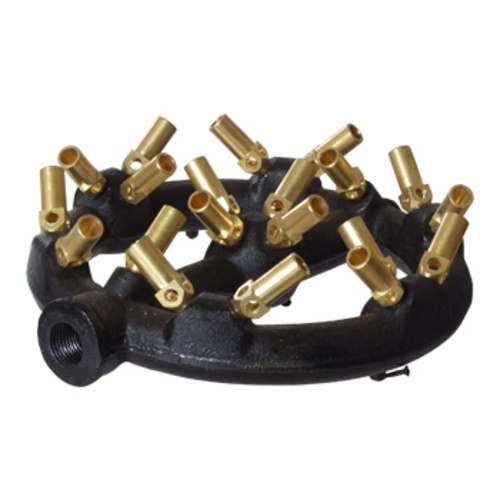 These propane burners are not for use on portable propane tanks, they are for use with large propane tanks with regulators that typically feed a rural homes where natural gas is not offered. This burner works great, very quiet and more efficient than my old jet burner, We make a 10 gallon batch in a converted get, it gets us up to a boil fast and even has a pilot burner so you don't have to keep re lighting it.